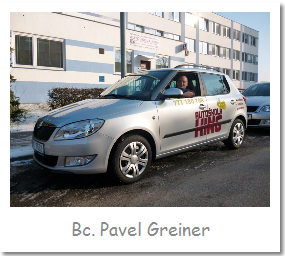 Pavel Greiner is the owner, director, and also a driving instructor at KING Driving school, which has been operating on the market since 2007. He founded the driving school purely for the pleasure he has from driving, and for seven years he has been trying, together with his team of instructors, to convey his enthusiasm to customers, which are comprised of many individuals and companies, and to provide truly comprehensive services to them. He has a driving school teaching licence and when possible he occasionally works as an instructor with the customers. In this way he constantly keeps in mind what his clients expect the driving school to provide, and he subsequently tries to respond to those requirements. Teaching in Czech and in English, including teaching materials. Attendance and online format for education within the scope of e-learning. Training of all types of driving licences, including professional licences. Training also for professional drivers and diving examiners (training of safety and protection of health at work and first aid, training of transportation of hazardous loads, work with fork-lift trucks, psychological examinations). Collaboration with government institutions for the possibilities of requalification of unemployed citizens. Licenced training of driving school teachers. Educational portal with a very comprehensive and visually attractive interactive graphical format. It includes instructional videos and testing. Benefits are time saving, speed, flexibility, simplicity and quality. Efficiency and convenience ensured thanks to the simple data input system. The company inputs the data once and the program then works with them – it notifies of approaching times and dates for re-training, changes to laws and any new things currently taking place. Ideal for training health and safety at work and fire safety and training of driving examiners.